Published: Nov. 30, 2014 at 11:54 p.m. Updated: Dec. 1, 2014 at 07:20 p.m. The waiver wire is one of the most important keys to finding success in the world of fantasy football. Each week, I'll offer up 10 players you need to target off the free-agent market as you look to reach your ultimate goal -- winning a league championship! And if you play in a deeper, or highly competitive league and all 10 of these players are already owned, be sure to check out our weekly deep dive waiver wire targets for some high upside players to aim for heading into Week 14. The Colts don't trust Trent Richardson as a featured running back, and that has been evident over the last two weeks since Ahmad Bradshaw was lost for the season. 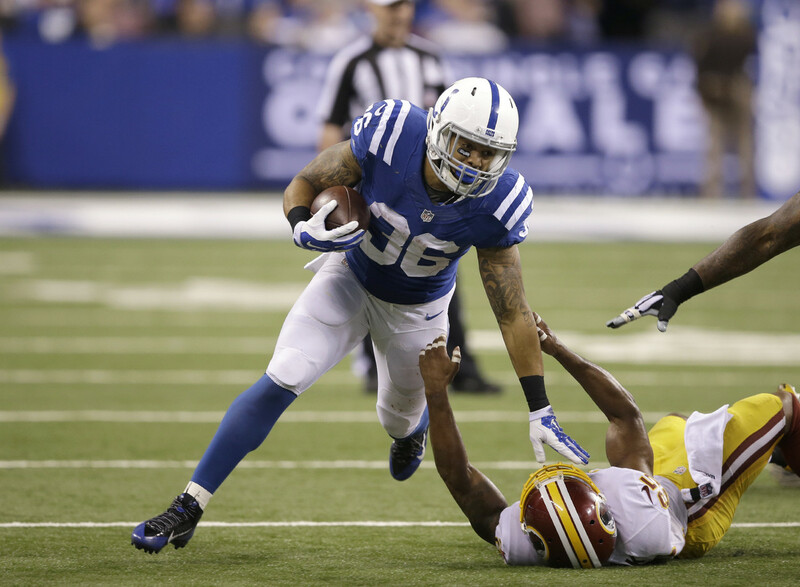 Instead, it's been Herron who has led the Colts in backfield touches and fantasy points during that time. At a point in the season when good running backs are hard to find on waivers, Herron now needs to be owned. Stills has been an absolute monster in the stat sheets in recent weeks, including an enormous 162-yard, one-touchdown performance in Week 13 that resulted in 22.20 fantasy points. He's been even better in PPR leagues, putting up a combined 58.0 fantasy points in his last three games. With Brandin Cooks done for the season, Stills needs to be added in all fantasy leagues. Will the Raiders finally get out with the old (Darren McFadden, Maurice Jones-Drew) and in with the new (Murray)? He looked amazing in Week 12, rushing for 112 yards and two touchdowns on a mere four carries in a win over the Kansas City Chiefs. While he did miss Oakland's Week 13 contest due to a concussion, he remains well worth a roster spot in all leagues moving forward. There is a major shortage of good fantasy tight ends in the NFL right now, so check your league's transactions to see if Reed was released over the last few weeks. He had missed several games with an injured hamstring, but he returned with a vengeance and 12.3 fantasy points in a loss to the Colts. As long as he's healthy, Reed is now a surefire No. 1 fantasy tight end. I told people to start Sanchez last week, and he responded with over 21 fantasy points. And while I would add him off the waiver wire, it's more of a move for the future based on matchups vs. the Dallas Cowboys and Washington Redskins in the final two weeks of the fantasy postseason. You'll want nothing to do with Sanchez in his Week 14 game against the red-hot Seattle Seahawks defense. I am a self-admitted Manziel-maniac, at least in terms of fantasy football, so seeing him under center in Week 13 was quite a good sign. Brian Hoyer has been awful in recent weeks, so it's not out of the realm of possibility that Johnny Football could take over the starting spot sooner than later. In fact, he could be a potential sleeper in deeper leagues down the stretch. McCoy has played a prominent role in two games over the last five Redskins contests. And in those two games, the Texas product has scored an average of over 20 fantasy points. Not too bad, right? In Week 13, he had 392 yards and three touchdowns and 26.88 fantasy points (albeit in a blowout) in Indianapolis. If you're in need at quarterback, McCoy is worth a look off waivers. I am not a believer in Fitzpatrick, but how can I leave him off the waiver wire after recording six touchdown passes and almost 40 fantasy points this week? I don't like his upcoming matchup against the Jags, though, as their defense has been tough on quarterbacks on their home field in recent weeks. But who knows, maybe the Amish rival will have a little more Fitz-magic. For fantasy owners in deeper leagues who need a wideout, Lee is now worth a roll of the dice off the waiver wire. With Allen Robinson done for the season, it's been Lee who has taken advantage of the newfound opportunities. In his last two games, Lee has recorded 127 yards, one touchdown and 18.7 fantasy points. That's more than Cecil Shorts, who has now faded to black. Moncrief only caught three passes in Week 13, but he made them count with 134 yards, two touchdowns and 26.0 fantasy points in a win over the Washington Redskins. On the downside, he had a combined 4.40 points in his previous three games and has scored more than seven fantasy points just twice all season. Still, Moncrief is well worth a flier in deeper leagues at this point.